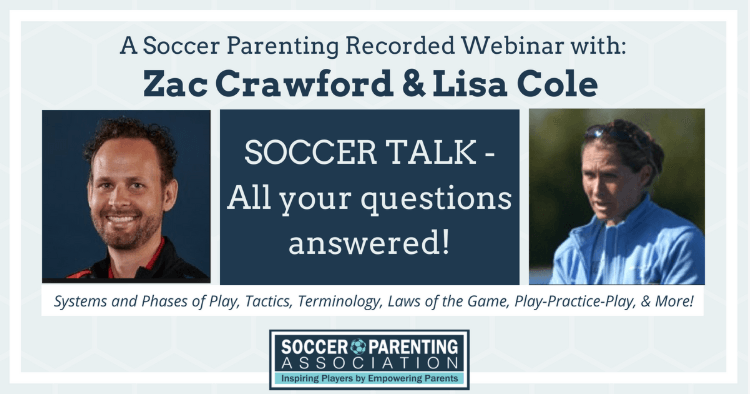 Zac Crawford works for U.S. Soccer as a Grassroots Coach Educator and Lisa Cole is currently working with the Washington Spirit as a Pro Scout and in their Development Academy, as well as is the Executive Director at Centre Soccer Academy in Pennsylvania. I have included a 10 minute portion of the wide-ranging hour-long interview below (transcript included). In this part of the interview, we had just finished discussing ideal practice environments where players are challenged and having fun…and then, for clarification on the important subject – I ask both Lisa and Zac to chime in about the lack of value we should place in a team practice environment on kids standing in lines and passing (or similar “drills”) to acquire skill. From there, Zac, who is largely in charge of the new Grassroots Coaching Licenses from U.S. Soccer, discusses in great detail the term we are hearing more and more in our youth environments: Play – Practice – Play. If you are interested in watching more interviews with youth soccer experts, be sure to check out the Parent Education Platform: ​SoccerParentResourceCenter.com where you will find over 30 interviews and webinars plus over a hundred articles, short interviews, expert responses to parent questions and much more! For now – enjoy the conversation below regarding Skill Acquisition and the new U.S. Soccer Grassroots Coaching Philosophy of Play-Practice-Play! Let’s break this down, so just if both of you can chime in here. An environment where a child is learning how to pass and they are standing in two lines passing back and forth and then going to the back of the line. Is that a good environment? Okay. I just want to be really clear on that to everybody listening, so the parents that are listening here you guys need to go into the world and make sure that, that’s happening for your children. It is still shocking because how we know that kids learn and how we know that kids acquire skills just through playing, I think it’s something that we need to be really clear about in these conversations because we know that. We talk about that all the time. When I’m working with parents I want to make sure they know, really understand clearly what we’re talking about. Soccer is a really unique sport compared to… my daughter played softball for a year, which was pretty painful for me personally. That’s a whole another story….But just batting practice and the throwing back and forth, and learning those…. Soccer doesn’t have to be that way. Lisa, you want to jump in a little bit, or Zac, whomever, but just explain, give parents some perspective on why soccer practice should not look like basketball practice or should not look necessarily like softball practice. Yeah. I mean I think when we see two kids back and forth passing, as parents and as adults, we can see success immediately, or see failure immediately. That’s why we like that because we can say, yeah that’s being well done, or it isn’t being well done. Where when you throw kids out on a field and they’re playing and there’s all this dimension to the game, it’s harder for the coach wanting to see success or successful passes and they want to keep up with it. For me, a good training session, a youth training session, is organized chaos. It’s organized. It’s a mess. The kids are bumping into each other at times. What you’re looking for are the key moments. That hey when that kid takes on, gets the ball away from their foot, and the see the goal’s open, and they take the shot right away instead of dribbling all the way to the goal and pushing it into the goal, right. You see them see things, or whatever your focus is, is that one moment when they actually get it. Then they’ll continue to get it, but if you don’t put them in ultimately [inaudible 00:02:37] experiences, so if I pass back and forth … I’m still excellent at passing back and forth. I can actually do it all day. No problem. In fact, I can still hit the crossbar every day all day, but I can’t receive a ball out, or there, off my chest, drop it down, and then ping it for a goal. That’s skill. I have the technique still. That’s what you’re really teaching is when you’re knocking a ball back and forth you’re kinda trying to get them to see the technique. I’m not saying that at times you see a kid with bad technique that you won’t pull them out, and say okay here’s how to properly hit it with your foot. Here’s how to do that. But if you really want to have skill development, well I’ve got to execute the technique in the game. So practice should look like the game. I want you to dive into this concept because we’re starting to hear it more and more, Play-Practice-Play. Zac, can you spend just a little bit of time explaining it since it is becoming quite a bit important terminology for us here in the States? Yeah, absolutely Skye. I’m gonna share our player development philosophy there in the chap because this is really where Play-Practice-Play starts. We believe at the grassroots level that children learn and develop to their full potential through game-like experiences in an enjoyable environment that supports individual growth. What that environment is about is the game-like experiences is that it must transfer back to the game of soccer, so that instance earlier of kids standing in line and passing the ball between cones, or running laps around the field, that’s not going to transfer. The learning’s not going to transfer back to the game of soccer, so you need to have a context within which they learn that transfers back to the game. We do that through this idea of Play-Practice-Play. Now I know a lot of the coaches I’ve heard before the methodology, Whole-Part-Whole. While there are some similarities between the two methodologies there are certainly some things that are different and I’ll explain the difference between them. Play is exactly what Lisa said she was having her kids show up and do. Come in and they drop off their water bottles and they go and they start playing, so right from the very beginning the coach has a goal, a training session goal that’s based off of the road map, so depending on which part of the field whether it’s our own half, we’re trying to move the ball forward. That’s what the training session goal is for that day. There’s certain of those player actions whether it’s pass or dribble forward, or spread out that the coach is also focused on as well as the key qualities, which read the game and make decisions is always there. It might be optimal technical execution or optimal physical execution. There’s six different key qualities that the coach can focus on. We say focus on two or three. When they show up to play it’s not just, hey roll the ball out. Let’s play. I’m the coach I’m gonna stand over here and talk to the parents, or talk on my phone, or whatever. The coach is observing right from the very beginning. The way the coach is teaching is through these guided questions, or keywords. The keywords are there just to kind of prime the kids. Maybe it’s head up if we’re working on dribbling forward that day. To move the ball into the opponents half. Maybe it’s take them on. That’s some of the keywords. But then there’s also guided questions, so during that play phase the kids will play for a little bit. They’ll get all of their energy out from school that day, or wherever they’ve been. The coach is there to observe to see how they’re doing on the goal. Then they bring everyone in and ask them the guided question. At first, we’re not asking for an answer from the players. Just think about it. Maybe talk to your teammates. Go get some water. Come back. Let’s play again. Maybe you could show me the answer to that question. Now, we talk about reading the game and making decisions. Players are able to do that through the guided questions. You let them play a little bit more. We bring them back in. We ask them the same question again now that they’ve had time to experience it, game-like experiences. They need to play it, so now they come back, and they give us the answers. That’s the first play phase. Two V two. Three V three. Four V four. Nothing really bigger than that unless it’s a 11 V 11 team. You might play five be five and include you two as the two goalkeepers. When you get to the practice phase now this is where more of the teaching occurs because the coach will continue to use the guided question, continue to use keywords, but now we have certain teaching actions that the coach can use. It could be a demonstration. It could be obviously positive specific feedback is used throughout. Like I said, it could be a demonstration, and though those are the different types of actions that could be used. Now, there’s the moments to use those. It could be a freeze. It could be a natural stoppage. It could be in the flow, et cetera. Those are just the moments, but what’s most important are the teaching actions. Out of those teaching actions we have the five elements of a train activity. We talk about, first of all, is it organized? Is it safe for the kids to play? Does it have the right amount of cones that are out there. The balls are ready, so that the ball’s not constantly going out of bounds. The field’s too small. The players are chasing it. After it’s organized is it game-like? Meaning is there attacking? Is there defending? Are the players trying to score goals? As in game-like we look at the level of challenge. Is there a balance between success and failure? So that way they’re right there at the good level of being able to be challenged appropriately where it’s not too much for them? Before challenging we look at are we getting repetitions of our training session goals? So are we able to see are we building out of our half. Then is it challenging? Are we having the right balance? Once those first four are there then the coach can get into coaching and use them as teaching actions The five elements are there from Play-Practice-and-Play. So. practice the coach is involved a little bit more with those different teaching actions. Then for the second play phase it’s the game. If you’re having a seven V seven team, and your maximum roster size is 12 you’re playing six V six. You’re using the full laws of the game, and you’re seeing has your teaching had an effect from play 1 and practice? Now, the coach is continuing to use those guided question and keywords. It’s similar to Whole-Part-Whole. However, in Whole-Part-Whole maybe you show up. You play a big game to start. You take out a small like part, and you play. Maybe you just focus on some technique. Then you go back and you play again. That could be one instance in Whole-Part-Whole. Where Play-Practice-Play is different is that one of our three major tenants of our coaching philosophy is that it’s holistic. Meaning that all parts of the game are interconnected and interrelated, and so that way we’re not just pulling out one aspect like technique, or physical component. It’s all there in a game-like environment. It’s reality based. Hopefully, it transfers back to the game. Play-Practice-Play is very similar to Whole-Part-Whole, but those are the differences. The idea behind it is this is what kids enjoy. This is how they learn. What do they do when adults aren’t around? They play. As a coach we’re not saying just completely step back and let the go off on their own. The coach is there to facilitate and help guide them through the learning experience. Also, because I mean so much research says is that, that’s how children learn better through playing. Skill acquisition happens when there is decision that are involved.